That dip in overall Web usage and worldwide productivity you just felt is likely to be merely the effect of Angry Birds Space finally dropping into app stores today. The long-awaited major follow-up to the highest-profile mobile entertainment hit of them all appears on the major platforms from Rovio. While the first time Angry Birds launched on mobile it was the humble wannabe among many other gaming apps, now it is arguably the only mobile-endemic media brand ever to become iconic. Now the Angry Birds franchise is visible in everything from pistachio commercials to the skull caps we just saw being sold in San Francisco’s Union Square near this year’s OMMA Global. News Corp’s TheDaily even created a custom publishing project around the development of the sequel. The “Special Edition” of TheDaily “Birds in space” on iPad reports on how Rovio came to find another level of game play by reimagining their irked feathered friends in low-gravity worlds. Rovio is the Finnish game company that released Angry Birds in 2009, but the company dates back to 2003. 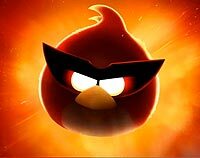 It claims that Angry Birds has been downloaded over 700 million times, and paid versions account for a quarter of those installs. It was among the first games to demonstrate how touch interfaces and physics invited new conceptions of game play and interactivity with the new kinds of digital screens. The Rovio plan has been to develop the birds into franchise icons along the lines of Nintendo’s Mario or Disney animated film characters. Last year the game aligned with the animated film release Rio, where it integrated a game clue in the studio’s Super Bowl ad. A new line of merchandise includes t-shirts, branded toys and books. It has marketing partnerships with Barnes & Noble, will open branded retail stores in China soon, and plans a theme park in the UK, according to a report from Reuters. For those who are not opening their app markets and stores this second to experience the game for themselves, Rovio released one last trailer this week teasing the game play.